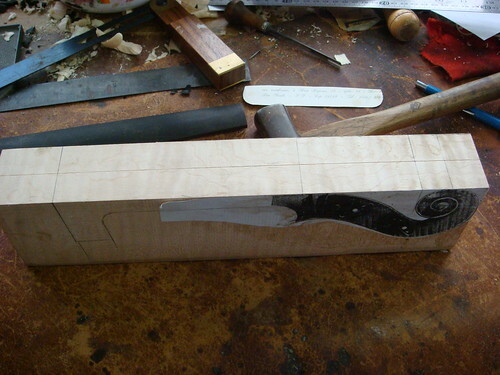 I think that it's important for players having some information about how their instruments are made. 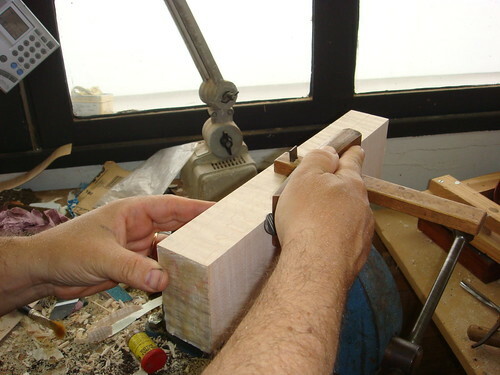 This is the way I carve my scrolls, others certainly carve them differently. The basic idea is giving some notion about the process I use. 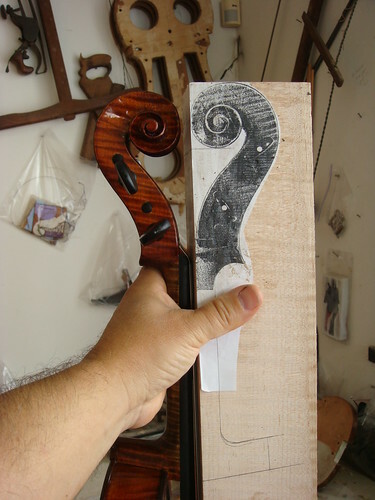 This scroll will be inspired on Andrea Guarneri, from the PRIMROSE viola pictured in Bein & Fushi monograph, but I'll make it without shoulders (that we call "ganasce", in Italian), since many violists don't like them and I want a light scroll also. 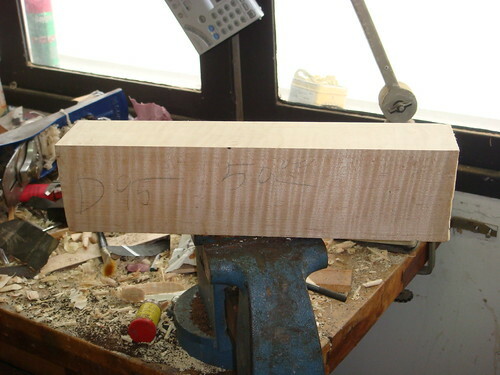 Now I'll reduce the neck block to its final thicknesses, that is the maximum width of the scroll, that corresponds to the eyes or last turn, in my case 46 milimeters (remember I'm carving a viola scroll). 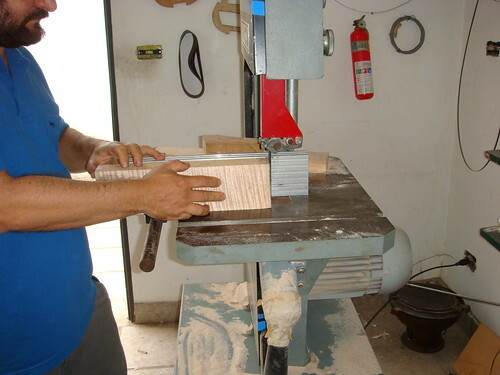 Since the sides of my block are parallel, I'll use a bandsaw to make two square cuts (with the planned fingerboard side down, facing the bandsaw's table) that will reduce my neck block to 46 mm. Now I'll take a xerox copy (real size) of the side views of my scroll model. I had just one view of this scroll, so I had to make a "negative" drawing of the other side. I find it an easy way to work, because I don't have to make models and I'll make no mistake while transferring the outline to my neck block. Many books (such as Biddulph's on Del Gesù) have both side views of the instruments pictured real size. Double, triple check everything prior to cut it. Now I have to rest for a while!!! Very cool! Your work must be incredibly satisfying. I look forward to future posts. Excellent, excellent post. I hope to see more in the future!! luis, really a treat for us to see it step by step. i see you use a pasted ?photocopy to ensure consistency. 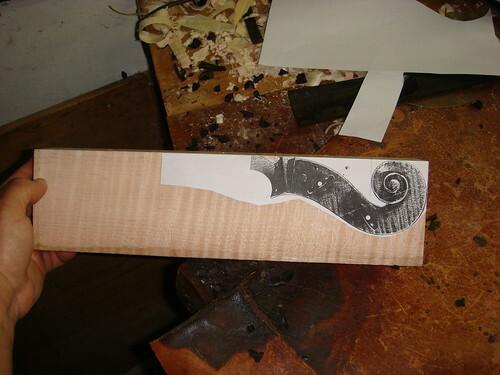 any records on how 18th century luthiers go about doing this so that the finished scrolls look alike in dimensions? 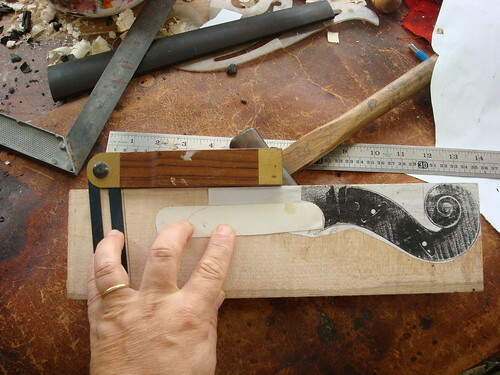 Al Ku: according to Sacconi, the old Italians used a template with small holes in the scroll region so that they could transfer the scroll turns outlines to the wood with the aid of a metal pin that was pressed against the wood and left an imprint. Remains of these imprints can be seen today on some Guadagnini's scrolls. When I visited Christophe Landon's workshop in NYC I've noticed that he also glues a xerox copy to his neck blocks in the same way I do. I'll continue this blog till the end of the scroll. Ciao!